The inaugural meeting of The Brigade’s All Party Parliamentary Group took place at the House of Commons on Wednesday 25th January. 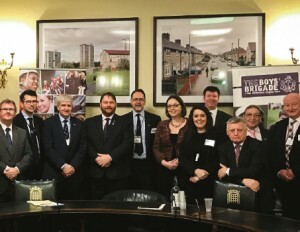 The group has been established to help promote and support the work of the Brigade and should also help to increase our profile at Westminster. Seven MP’s representing different political parties were present and many more MP’s and members of the House of Lords have indicated their wish to join the group. The group is planning to meet two or three times each year. Owen Thompson MP for Midlothian and an ex-member of the 1st Loanhead agreed to be the chairman of the group and the Brigade President was appointed as one of the Vice-Chairs. If you know of other parliamentarians who are ex-members or supporters of the Brigade it would be helpful if you can let the Brigade Secretary know.